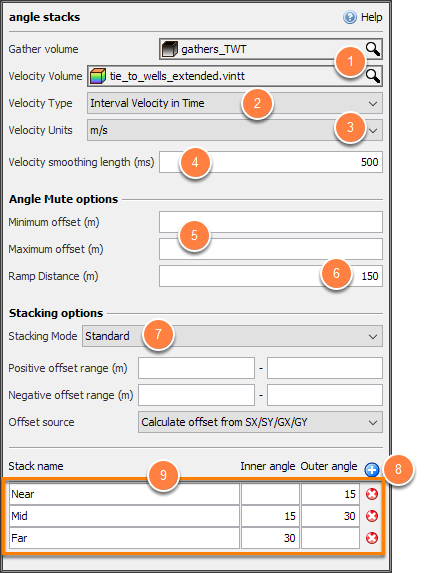 Description Create one or more angle stacks from gathers using a velocity volume. The Angle Stacks process creates angle stacks from a gather volume using a velocity model. 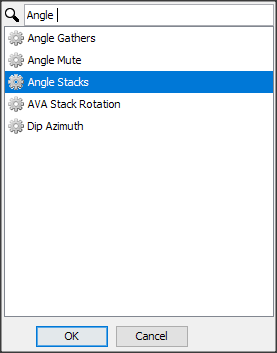 Different muting and stacking options are available. Search and double-click Angle Stacks. Select the Gather and Velocity Volume. If you provide offset gathers, a velocity model is required to calculate the paths of the angle mutes. At Velocity Type, select the type of velocity used in the process. At Velocity smoothing length (ms), additional smoothing can be applied to the velocities before use (for more information regarding this parameter, see Creating an Angle Mute). (Optional) specify a Minimum and/or Maximum Offset to apply offset-domain mutes. Set the mute Ramp Distance to taper the mute. Stacking options: choose a stacking mode and define the positive and negative offset ranges (see Stacking for more information). Blackman: Same as offset, with the input values being weighted by a Blackman window rather than the offset, such that the near and far offset values are damped relative to the mid-offsets. Hamming: As for Blackman mode, with a Hamming windowing function used in place of the Blackman windowing function. Median/mean: Returns the mean of the values within 'percent to keep' of the median where, for example, 70% will eliminate the lowest 15% and highest 15% percentiles from the mean calculation. Name the stack: e.g. Near, Mid and Far.